The Oregon Department of Justice (DOJ), headed by Attorney General Ellen F. Rosenblum » serves as the state’s law firm. Not to be confused with the Oregon Judicial Department ». The Oregon DOJ employs over 1,300 individuals statewide and has a biennial budget » of approximately $550 million. The agency is headquartered in Salem and has ten legal and 13 child support offices throughout the state. In addition to providing legal representation to state government, the DOJ advocates for and protects all Oregonians, especially the most vulnerable, such as children and seniors. The Oregon DOJ and its nine divisions are tasked with running programs related to child support », charitable activities », district attorney assistance, crime victim compensation » and consumer protection ». The Oregon DOJ advises state agencies and officials on legal issues pertaining to their responsibilities. The Attorney General performs legal functions on behalf of the state through attorneys in the Appellate », Civil Enforcement », General Counsel » and Trial » Divisions. The Office of the Attorney General was established in May 20, 1891. The Act of 1891, established the position as an elected office and set the term of service at four-years. The Act also stipulated that the governor would fill a vacancy, if one occurred, until the next general election. Elections are partisan and statewide. Oregon is one of five states where this office was not established by constitution. 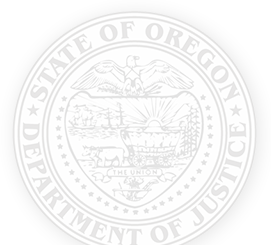 In 1947, the Oregon Department of Justice was created with the Attorney General named as department head.